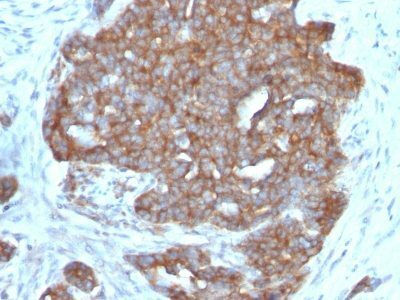 This antibody recognizes a polypeptide of 6.5 kDa, identified as pS2 estrogen-regulated protein. A synthetic peptide from the C-terminus of human TFF1 protein. 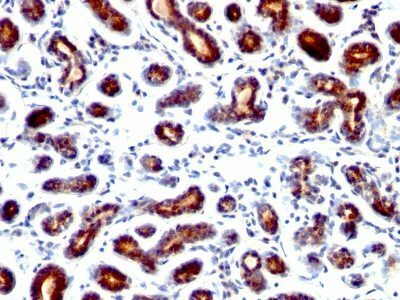 This antibody recognizes a polypeptide of 6.5 kDa, identified as pS2 estrogen-regulated protein. Its epitope is located in the c-terminus of human pS2 protein. pS2 is a trefoil peptide. Trefoil peptides are protease resistant molecules secreted throughout the gut that play a role in mucosal healing. These peptides contain three intra-chain disulfide bonds, forming the trefoil motif, or P-domain. pS2 is known to form dimers and this dimerization is thought to play a role in its protective and healing properties. About 60% of breast carcinomas are positive for pS2. Staining is cytoplasmic, often with localization to the Golgi apparatus. pS2 is shown to be localized in normal stomach mucosa, gastric fluid, goblet cells in the colon and small intestine, and in ulcerations of the gastrointestinal tract. Several studies have shown that pS2 is primarily expressed in estrogen receptor-positive breast tumors and it may define a subset of estrogen-dependent tumors that displays an increased likelihood of response to endocrine therapy. Catalog number key for antibody number 1091, Anti-pS2 (TFF1/1091) The prefix indicates conjugation, followed by the antibody number and size suffix.